The final day of the 2016 inter-pro’s ended in dramatic fashion as first rain and then regulations conspired against the Southern XI and saw the NCU crowned this year’s champions. However it wasn’t without controversy and many spectators and players were left frustrated by the officiating at the end. Friday morning greeted us with glorious sunshine and for once we were optimistic for a full day of cricket. The forecast was for scattered showers but they were hard to imagine as blue sky was everywhere to be seen. Our hopes were abruptly dashed when we arrived at Instonians CC. Despite the sun, the square was deemed unsafe and any play at all was unlikely. Luckily, Osbourne Park (which was hosting the LCU v NCU) allowed the match to go ahead on its lower pitch. The players and fans alike rushed across the road to Osbourne and with the weather still fair, a 41 over game would go ahead at 12:45. The permutations were simple. If NCU beat Leinster, then they would be crowned champions. However if the NCU lost, then the winner of Southern XI vs NWCU could take the title (provided they won by a big enough margin to assist net run rate). So with all to play for, Southern XI batted first as a light drizzle came over the ground. Runs were hard to come by early on, as a slow outfield coupled with tight bowling made scoring difficult. Martin Kavanagh was the first wicket to fall when he nicked a full one and a sharp catch was taken at first slip. The rain suddenly got much heavier and had the players running for cover soon after. Play got underway again 30 minutes later but the match was now reduced to 37 overs. At 14-1 off 7, it was important that the Southern XI started to get a move on. That came through Alam Baloch and O’ Halloran who started pouncing on any width. Alam Baloch also unleased a couple of ferocious hits over cover for 4’s. This led the fielding captain to turn to his spinners for control. However the opposite ensued as the batsmen scored freely off the frequent short balls. O Halloran fell LBW soon after to a fuller ball from Logue, but Alam Baloch continued to score. He drove well and hit a massive 6 over mid-wicket to the delight of his teammates. He got good support from Jones, and the two of them accelerated the scoring rate. Jones put away a couple of full tosses to the boundary and followed with a big 6 over cow corner. Alam Baloch then hit a nice 4 over mid-off to bring up his excellent half century. Both men were out soon after (for 25 and 59) , both bowled trying to keep the boundaries flowing. The tail wagged and ran lots of quick singles. Rain arrived just after the 37th over as the Southern XI closed on 179-7 off 37 overs. The rain remained steady for much of the next hour as the scorers and umpires scrambled for the Duckworth Lewis sheets. Play in the NCU vs LCU was almost certainly over for the day, but there was hope that our match would be played to a conclusion. 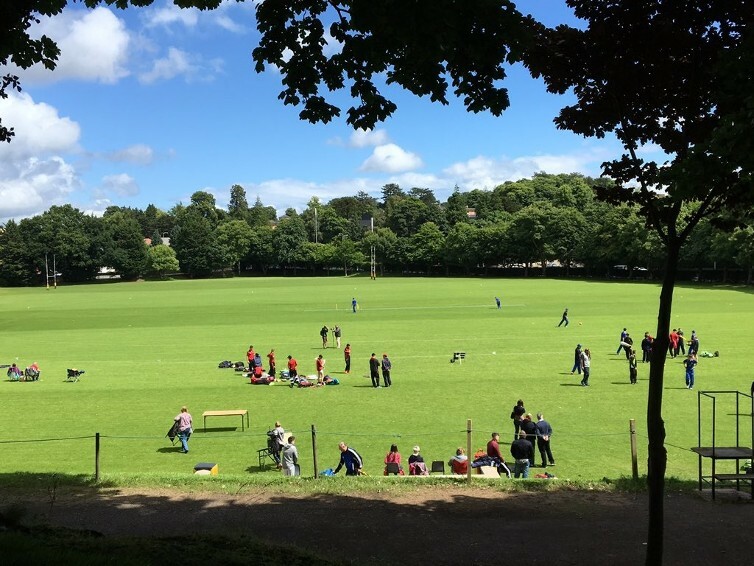 The frequent showers seemed to hamper the umpires every time they tried to restart, but eventually the sun returned and the NWCU were set a tough target of 160 in 29 overs. The Southern XI knew that a second victory was well within their grasp and they started the more brightly. Opening bowlers MacNulty and Jones bowled with pace and MacNulty made the breakthrough, having Magee caught behind early. A couple of overs later, Carey made a diving stop at backward point and both batsmen were caught half way down the track. His accurate throw at the bowlers end meant that Dunn was run out and NWCU were struggling at 7-2. Word was now coming through that the other match was abandoned and heading to a bowl out. A win from Leinster would put the Southern XI and the NWCU in with an unlikely title shout. A big crowd gathered under the sun on the top pitch to watch the dramatic Bowl out. It was best of 11 but after the first 22 attempts, it was tied at 1-1. All four teams had a serious interest in the result and in Sudden Death it took Archer of Leinster to step up and hit for the second time for them to win 2-1. The NCU players were dejected as they now knew that the title was out of their hands. All they could do was hope for a close match down below to keep them ahead on Net Run Rate. Suddenly all eyes were on the organisers as they tried to derive the permutations required for both the Southern XI and NWCU to win the title. For the Southern XI, they had to restrict NWCU to under 122 from their 29 overs. Almost immediately the Southern XI played like men on a mission. They threw the ball to the spinners and Carey and Hussain provided an instant slowing of the run rate. They offered no width and pressure built on the batsmen. An attempted big shot was unfortunately spilled in the deep. All the LCU and NCU players and supporters were now watching this game too. Dark clouds started to appear over the horizon and it quickly became apparent that the Southern XI would have to get through 20 overs to get a result. The spinners sped through their overs, yet their control didn’t wane. The third wicket fell on 42 when more sharp fielding led to another run out. Unfortunately the rain didn’t hold off and play was suspended with the NWCU 46-3 off 17, with Carey returning top figures of 0-7 off 5 overs. Confusion then began to spread regarding cut off points and minimum over regulations. Southern XI were comfortably in control with NWCU requiring another 114 off 72 balls. The umpires announced that play had to resume by 18:35 to avoid a wash out and bowl out. The rain was easing and brighter clouds appeared over the horizon; the question was would they arrive in time to save the Southern XI. The NCU players were hoping that this weather would continue as a washout would have them declared the winners. At 18:25 the rain ceased much to the relief of all. Within seconds the Southern XI fielders and the opposing batsmen were in position to re start. However no umpires were present. Once the rain stopped they had retreated back into the clubhouse to get the revised Duckworth Lewis sheets. They revised the target and the NWCU required an almost impossible 62 off 18 balls to win the match. A second win of the week and a possible tournament title seemed destined for the Southern XI. Bizarrely, it took the umpires several minutes to re-appear and almost as soon as they came out, the drizzle started once more despite the continuing sunshine. They stood on the edge of the boundary announcing that they would not restart until the shower passed and that it had 4 minutes to do so. Both teams were keen to finish the match and drizzle would have been played through in any other situation. In fact the previous day, the umpires finished the match in much worse weather, when the Southern XI were well ahead of the NCU in D/L. At 18:37 the rain gave way to blue sky, but it was too late. The umpires ruled that the cut-off point had been missed and the match would go to a bowl out. NCU were declared the winner and the bowl out would be played out for second place. For the second day the Southern XI players were in despair. A bit of common sense should surely have prevailed, especially for an underage match. The minutes lost by the umpires in getting the D/L sheets (which should have been ready to go for the restart) could surely have been added on at the end. After the adrenaline rush of the previous hour, the Southern XI players were dejected for the following bowl out and lost it 3-1. Carey was the sole hitter for his side. The end table read, 1:NCU 2:NWCU 3:Southern XI 4:LCU. It was an unjust end for the Southern XI. They were so close to winning all three matches, and instead went home with just a solitary victory. Two days in a row, rain ruled the roost against them. However it shows how far this team has come in the last year. The whipping boys no more. I have no doubt, buoyed by these results that they will come back stronger next year and hopefully lift the trophy in twelve months’ time. But for this year, congratulations to the NCU for winning and hosting an extremely competitive and exciting tournament. Looking forward to 2017 already.